"Here's a questionnaire to reflect back on the school year." The students all CHEER in excitement when they look over the questions they get to answer! This has NEVER happened! Maybe they cheer for the end of the school year but not for getting to answer questions. 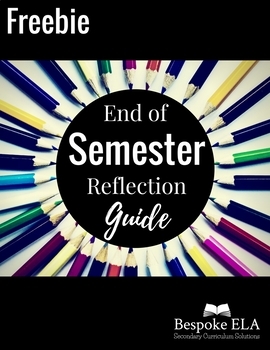 There are lots of creative ways to facilitate reflection at the end of the school year. Integrating novelty into any lesson makes it more interesting, and the same concept applies to reflection questions. So I set out to create an interactive "Prompt Sticks" Reflection Question game to get students more interested in assessing their learning at the end of the school year. There are LOTS of ways to use prompt sticks for writing— from creative writing activities to analytical essays. But here’s a way to use prompt sticks as a tool to facilitate meaningful reflection. This game uses the basic concept of reflection questions but integrates a "game" element using dice and "prompt sticks" to make it more interesting. Have students break into groups. Give each group the supplies above. Begin by dividing the popsicle sticks into four piles and color code the sticks into the following categories: assignments, skills, texts, and questions. The sticks can be color coded by coloring the ends with a preselected category color, or students can use symbols by drawing them on the ends of the sticks. You can choose to have your students create these sticks, or you can do it yourself; it's up to you, but students have fun making them, and the brainstorming process is an effective reflection activity in and of itself. For the "Assignment" sticks, write on them the major assignments from the school year (i.e. Macbeth Project, Non-fiction Newspaper Project, Renaissance Gallery Walk, etc.). For the "Skills" sticks, write the major skills targeted during the school year (i.e. persuasive essay, blending evidence, compound sentences, metaphors, close reading, etc.). For the "Texts" sticks, write the titles of the major texts from the year (i.e. Macbeth, Into Thin Air, Canterbury Tales, etc.). What did you think about __________ this year? What was your favorite part about __________? Why was this your favorite part? What was your least favorite part about __________? Why was this your least favorite part? What do you remember most about __________? Why is this so memorable? What was the most difficult part about __________? Why was this so difficult? What was the easiest part about __________? Why was this part easy? What confused you the most about __________? Why? What did ______________ remind you of? Explain. What did you learn about __________? What do you still want to know more about __________? Do you think you mastered __________? Why or why not? After the Prompt Sticks are ready, students can begin to play the game. Each "round" always begins by drawing a question stick first. The student picks a question stick and then rolls the dice. The number rolled on the dice determines which category to choose from next in order to fill in the blank on the question stick. If the player rolls a one or two, then the student draws an "Assignment" stick. If a student rolls a three or four, then the student draws a "Skills" stick. If a student rolls a five or six, the student draws from the "Texts" sticks. Students are to read the question stick and fill in the blank with the item from the second stick they drew as determined by the dice roll. For example, if a student chooses the question stick “What did you think about __________ this year?” and “argumentative writing" from the "skills" sticks, it would create the question: "What did you think about argumentative writing this year?" Once a student has created a complete question by drawing prompt sticks, the students can then answer the question. There are a few ways to have students answer each question. The student who draws the question can answer it himself/herself, or the person who draws the question can have the group members respond and discuss. Additionally, you can opt to have students write down their reflections and submit them for a grade. Determine which strategy works best for you and your students and give directions accordingly. If you would like to have students turn it into a competition, groups can assign someone to keep "score." Students earn points based on the number they roll on the dice. For example, if a student rolls the number four, that student earns four points and so on. From there, you can assign one number (such as the number three) to be the "bad number," and if a student rolls that number, he/she loses ALL OF HIS/HER POINTS! You can also add in other options such as double points for rolling the same number twice in a row, or challenges based upon rolling certain numbers. For example, I've had students integrate the following "challenge": If you roll the number one, the person to your right gets to decide upon a question to ask you. If you can't answer it in a meaningful way, you LOSE a point! You can even allow students to come up with the rules as they go to make it more interesting for them. Remember that the point is to get them reflecting back on the school year, so letting students create new rules for the game can get them even more interested in playing it! 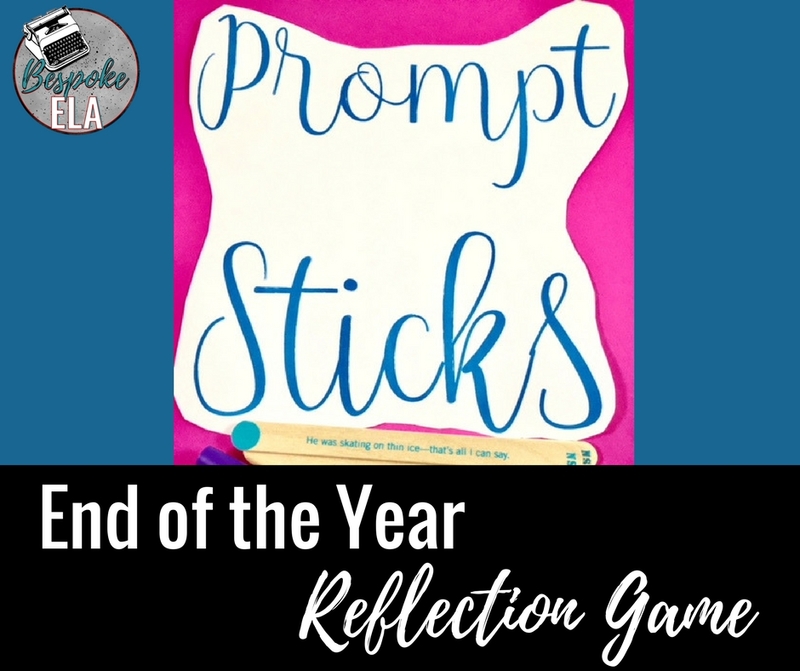 The Prompt Stick Reflection Game is a way to bring novelty and fun to the same old reflection questions at the end of the year. Give it a try and see how it goes!